Screen capture of Chrome’s error message relating to a wrong date-based pattern match. 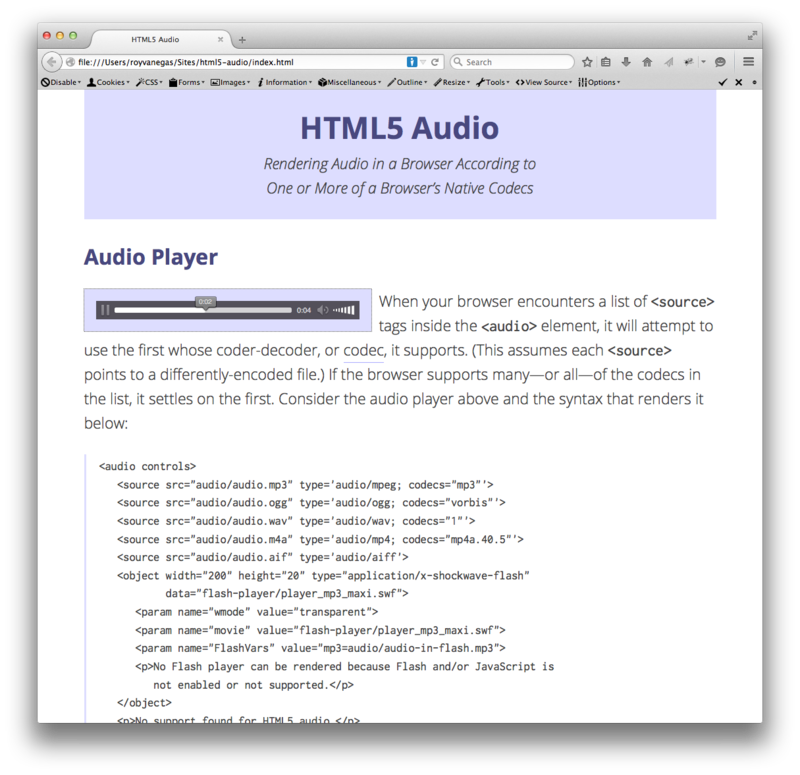 HTML5 audio has matured significantly since it was introduced in 2009. In its early days, for example, none of the major browsers supported the same audio file types, of which there are many. Today, however, they all support MP3, making it easy to render basic audio in a browser. A more elaborate tutorial is available on GitHub, where you can contribute to the discussion. 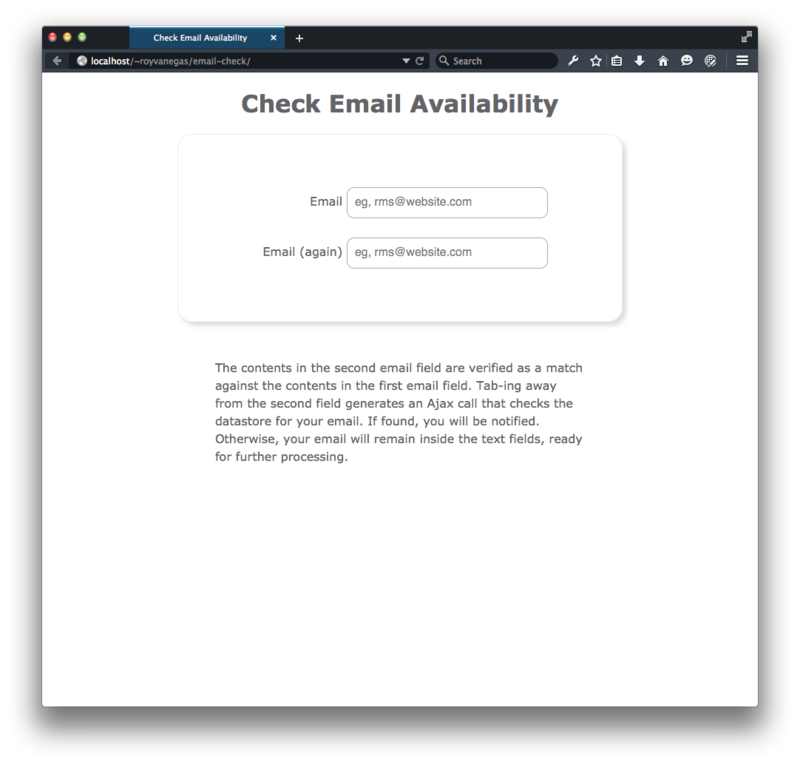 The initial page of the Check Email Availability app. When teaching Ajax concepts, I’ve always shared a small web app that checks whether an email exists in a database. The code is now on Bitbucket and a video on how it works is on YouTube. It’s a self-submitting form (in PHP) and defaults to the GET method for posting. The convention, however, is to list width before height. Browsers do it. Image previewers do it. 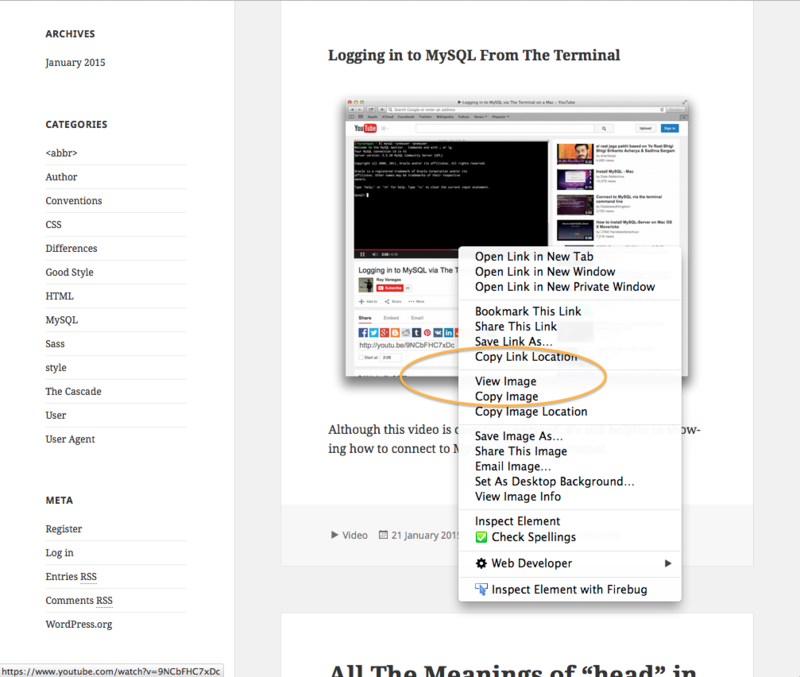 then hover your mouse over the title tab, you’ll see the image’s width listed before its height. 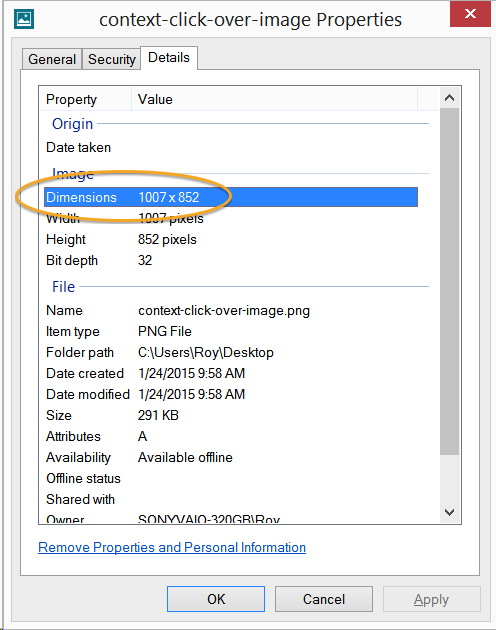 And, lastly, in Windows 8.1, if you view an image in Windows Photo Viewer and bring up the Properties panel (Alt + Enter), then click the Details tab, you’ll see the image’s width listed before height under the Image heading. If you make a mistake in the spelling of a tag, that is, if you spell a tag that is not defined by HTML, then browsers will typically ignore it. If your misspelled tags contain content, the tags are ignored, but the content is rendered in a browser. The content “Here’s my misshapen document” in the following example will be rendered in the browser, but the tags will be ignored. It’s important to understand the distinction between the terms “user agent,” “user,” and “author” when discussing CSS’s cascade. A user agent, or UA, refers to any browser when the term is used to discuss web-based technologies. Firefox, Chrome, and Opera are all user agents. A user is synonymous with a computer user. For example, I visit every web page on the Internet as a user. And finally, when I write CSS code, I am wearing the hat of an author. Similarly, when I write an HTML, I am the author of that document. 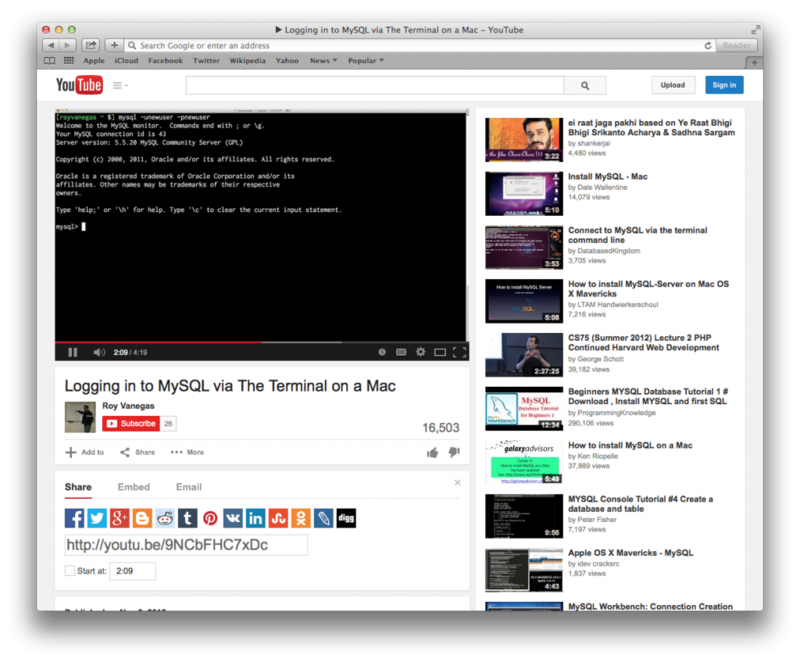 Although this video is over two years old, it’s still helpful in showing how to connect to MySQL from The Terminal. The word “head” takes on various meanings in HTML. For example, as the head of a document, the head of a table, or the heading of a section. There are other uses. Within a tag, head appears—or is implied—in <head>, <header>, <thead>, <th>, <h1>, <h2>, <h3>, <h4>, <h5>, <h6>, and <hgroup>, which appeared in HTML5 and is deprecated in HTML5.1. At the top of your HTML’s source code, as the first descendant of the <html> element, is the <head> element. This is defined as the head section of your source code. Placed at the top of a section, or, more typically, at the top of the <body> element, the <header> element defines a header of a section, which typically contains a heading. Short for table heading group, the <thead> element encompasses a block of rows that defines a table’s headings or labels. As such, it’s referred to as the table’s heading. In the following example, First Name and Last Name are in the table’s heading. Composers is the section’s heading, not the table’s heading. As mentioned before, First Name and Last Name are in the table’s heading. Short for table header cell, the <th> element represents a heading cell, often within a table’s heading section (<thead>), that defines the heading of a column or a row. Thus, this element represents a column heading or a row heading. First Name and Last Name are now row headings. In closing, here’s a full document combining each of the previous examples. Screenshot of simple drop down menu. I’ve shown this drop down menu in class multiple times over the years, but I have never shared it. The project is now available on GitHub. You’ll need Sass to compile the CSS. Essential HTML, Proudly powered by WordPress.